Looking For Self Storage in Marshall, MI That's Hassle-Free? We have clean, secure, and affordable self storage units near Battle Creek. Are you an Albion resident and need a storage unit? Our storage facility is located just 10 miles away on the I-94 East. Our self storage facility is proudly locally owned and operated out of the city of Marshall. Are you in Battle Creek and need an AFFORDABLE storage unit? Our facility is just 15 minutes away from Brownlee Park on the I-94 West. Marshall Mini Storage takes pride in offering a simple and hassle-free self storage experience for all of their customers in Marshall, MI. We make sure our storage units are clean, secure, and ready to rent. We also focus on offering a wide variety of storage unit sizes and types to make sure we can handle any self storage need that you may have. Marshall Mini Storage also offers online rentals and online bill pay 24/7 to make your experience a little more quick and easy. Feel free to look at our available storage units and give us a call if you have any questions or simply rent your unit right on the website. Why Rent Self and RV Storage From Marshall Mini Storage? We are owner operators, and we are dedicated to customer service. We are committed to offering you exceptional value for your hard earned money. Published rates are retail residential. Commercial rates available upon request..
Unit Ceiling Starts at 8' and extends to 14'. 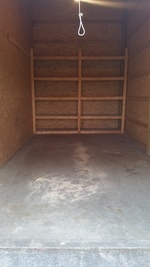 Storage for Vehicles, RV's,Trailers, etc. Unit Ceiling Starts at 8' and extends to 14'. A 5x10 storage unit is the size of a small walk-in closet. Unit Ceiling Starts at 8' and extends to 14'.A 10x10 storage unit is the size of half of a standard one-car garage. Unit Ceiling Starts at 8' and extends to 14'. A 10x20 storage unit is the size of a standard one-car garage. It fits the contents of a multi-bedroom house, including several over-sized items like a couch, a refrigerator, a washer/dryer and a dining room set or several large boxes. Has an extra 80 - 100 sq.ft. shelf for storing boxes. Unit Ceiling Starts at 8’ and extends to 14’ with loft or shelves. A 10x20 storage unit is the size of a standard one-car garage. Office box shelves along the back wall of unit. Unit ceiling starts at 8'and extends to over 14'at the peak. A 10x20 storage unit is the size of a standard one-car garage. Unit ceiling starts at 8'and extends to over 14'at the peak. A 10x20 storage unit is the size of a standard one-car garage. Unit has an extra 80-100 sq.ft. loft for storing boxes. A 10x22 storage unit is the size of a standard one-car garage plus two extra feet. It fits the contents of a multi-bedroom house, including several over-sized items like a couch, a refrigerator, a washer/dryer and a dining room set or several large boxes. Unit ceiling starts at 8'an extends to over 14'at the peak. A 10x30 storage unit is as large as a 1 ½ car garage. Unit ceiling starts at 8'and extends to over 14'at the peak. It fits the contents of a fully furnished 3-5 bedroom house, including over-sized items such as a couches, beds, dressers, a refrigerator, a washer/dryer, a dining room set, an entertainment center and several large boxes.